Elderberry plants bloom in early to midsummer to provide a harvest from July through September in most parts of the U.S. Because fresh elderberries have a tart taste, they're more often cooked and used in jellies, jams, pies and beverages. You can use the fruit dried, fresh or frozen. Three main varieties of elderberry grow in North America. European elderberry (Sambucus nigra) is also known as black elder or common elder. 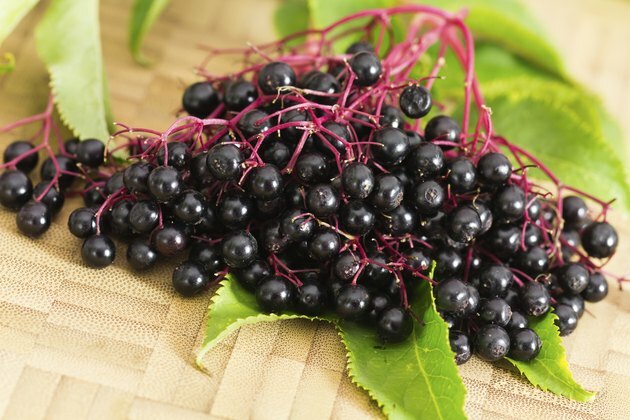 American elderberry (Sambucus canadensis), also known as sweet elder or black elderberry, produces berries with a flavor slightly sweeter than those of European elder. The leaves, stems, bark and roots of the red-berried elder (Sambucus racemosa) are considered dangerous, as they contain cyanide-producing toxins. While the berries are deemed edible, the USDA Natural Resources Conservation Service warns that the berries of this elder may be toxic unless they are properly prepared. Fresh, ripe elderberries can be tart, tangy or bitter. American elderberries are definitely the sweetest variety, however, elderberries do not have the same level of sweetness as more palatable varieties, such as blackberries or raspberries. Most people consider elderberries too bland, bitter or astringent to eat raw. Most people prefer to use elderberries in recipes. The berries develop a far better flavor, sweet and juicy, when processed for use in food and drink. You should wash and cook your berries for best use. American elderberry flowers are also edible. Elderberry jams and jellies has a sweet-tart taste with earthy undertones. Elderberries can be delicious when spiced with cinnamon, allspice and cloves. Elderberries also add complexity and tannins to homemade wines. You can use elderberries in recipes with other fruits. The berries mix well with other fruits in pies and other desserts, adding color and depth of flavor. Try adding elderberries to your favorite apple or blueberry pie fillings for something different. Elderberries also have medicinal purposes. Elderberries can be used as a natural remedy for cold and flu symptoms, as well as allergies. You can brew elderberries in tea or make syrups or infusions to unlock these health benefits. The difficult part of handling elderberries is separating the stem from the berry, as a waxy substance exudes from the stem. Freezing the berries then removing them from the stems may make the task easier. Wear old clothes when working with elderberries because they tend to stain. 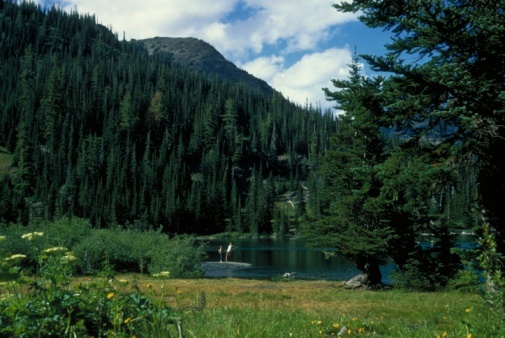 Elderberry plants are easily confused with toxic water hemlock (Cicuta mexicana), which grows in the same areas. Do not touch water hemlock. Elderberry has leaves oppositely arranged, paired along the stem, while hemlock has alternate leaves. Elderberry stems have white or light gray pith and emit a foul odor when crushed, while hemlock stems have hollow pith and purple stripes.